A long, long time ago I started a Swoon quilt. I cut out the first blocks almost a year ago. 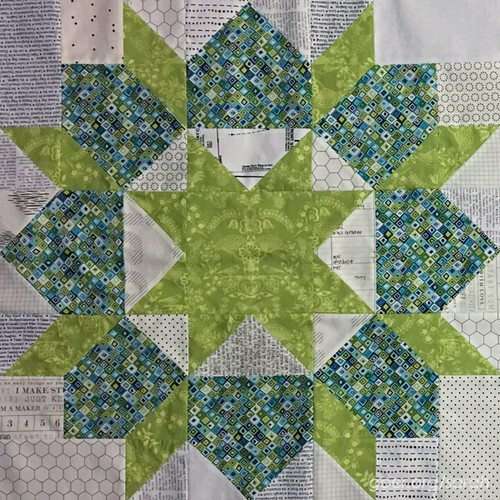 I finished my first block and then the project moved to the back burner. I decided that Sarah's 4x7 Sewing Challenge was the perfect excuse to focus my daily selfish sewing time on my Swoon quilt. I'm happy to report that in the first week, I've finished two more blocks. These were both already in progress at the start of the month, but with 65 pieces per block, these 24" blocks take a while. You can see my progress pics on Instagram. I'm linking up to the Week 1 Progress linkup for the 4x7 Sewing Challenge. Posted in Quilting. 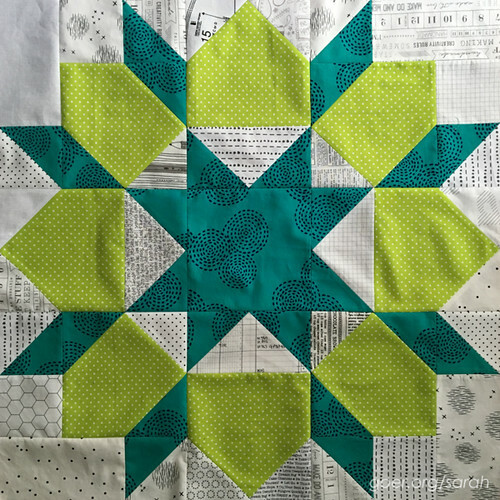 Tags: 4x7 sewing challenge, Swoon quilt on February 7, 2016 by sarah. Thank you, Mary. I won't be repeating fabrics. I'll need to go through my stash again for the last couple of blocks. I'm eyeing an Alison Glass print that would work well if I end up needing to purchase fabric. I'll be making 9 blocks total, which will finish at 80"x80". You have an eye for fabric combinations! I can't wait to see what's next! As a non-quilter, these look so fancy and complicated to me! And I imagine they look fancy and complicated even to experienced quilters. I'm happy to just admire them. :) Beautiful work, Sarah! Gorgeous blocks. The first combo is my favorite. Great looking blocks. Didn't realize they were so big. Good luck with the 4 x 7 challenge. 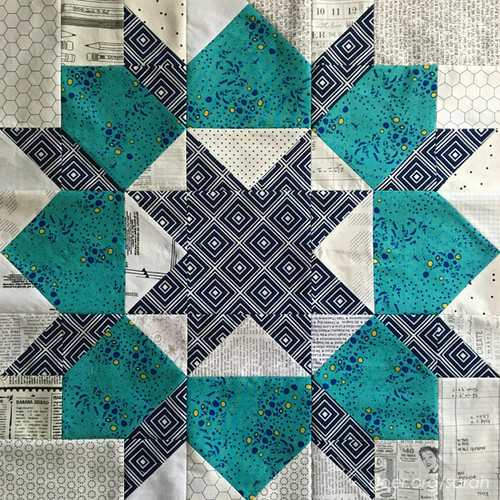 The pattern is available in three different sized blocks. I love the big ones. After all that work it's nice to have some much area complete. ;-) Thanks for visiting, Anja! I really like these blocks but those pieces!! 65 per block! I feel like this really looks like a quilt, where as some of my quilts are big squares or strips sewn together. I would be thrilled to complete these blocks with such precision! It's a daunting task and they look great!! Thank you, JoAnna. These certainly aren't blocks that I crank out with any speed. Good thing I don't have a deadline. ;-) Squares and strips can make lovely quilts as well. I really love your rainbow strips. I think that left pull for the next two blocks is going to be my favorite out of all of these, but the whole dang batch is looking so good so far! 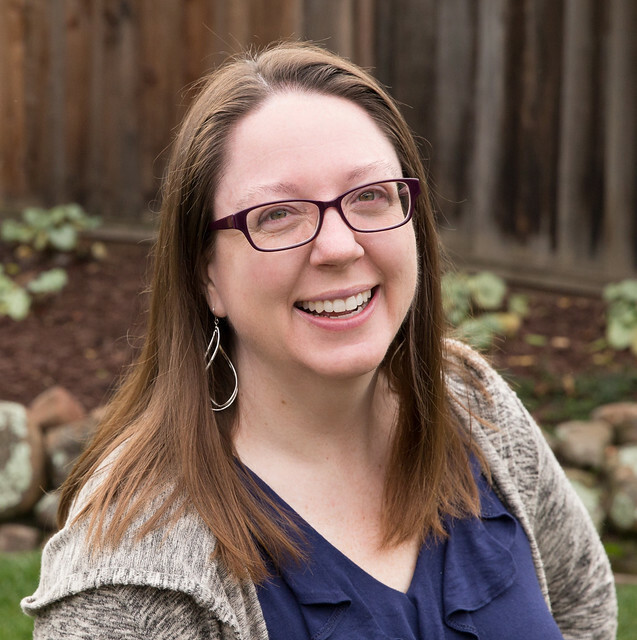 You really know how to harness the power of the challenge, Sarah - you get so much done! I should have clarified in the fabric pull picture that I'm intending to pair them across... the thing with having a good pile of fabrics is that there are endless possible ways to pair them up! I've had a lot of fun creating and moving around those fabrics! Thanks for the motivation, Sarah! Selfish sewing is good for the soul sometimes. It must be the season of swoon. I've sort of been joining you in your sewing, but making mini swoon blocks. The fabrics you've been using are so pretty. It will be a beautiful quilt. Thank you, Tish. I have spent so much time surfing through Swoon pics on IG. There are SO many beautiful versions out there. I've made the 16" size (for a mini quilt), but I haven't tried the mini size yet. Good luck with your project. Your blocks look perfect! Shew, so many pieces per block but they look so lovely! 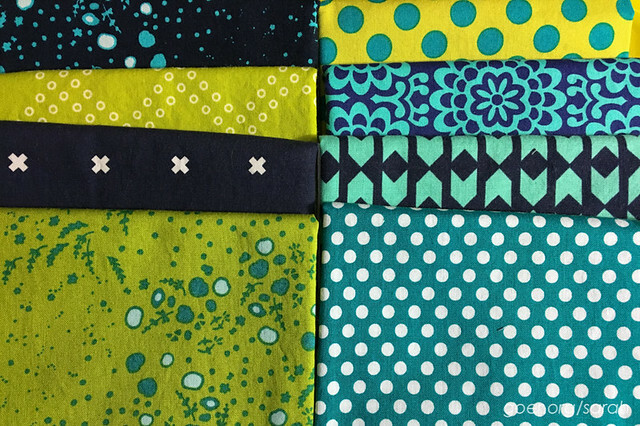 I spy Alison Glass fabric and it is scrumptious in these! :) Looking forward to seeing your progress through the 4x7 challenge! I love me some Alison Glass fabric! Two of the blocks that I just cut out are using some of the other colors of that print. I can't wait to get some of her newest line! Thanks for visiting! Your blocks are amazing. Love, love, love all the beautiful fabrics you used. Thank you, Jennifer. It's so much fun to work on a project where I love the color palette and fabrics as much as I do for this one.